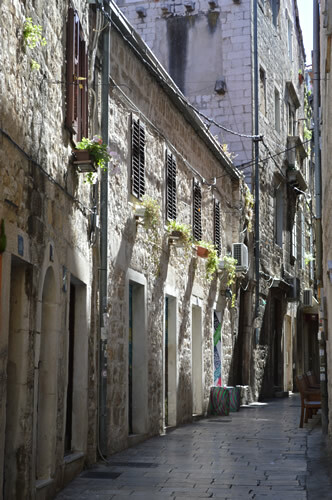 One of the great benefits of catching the early morning ferry into Split, is the opportunity to wander around the backstreets when they’re not so busy. On this particular Sunday, we had a plane to catch, but that wasn’t until lunchtime. In the meantime, we could have a tasty breakfast on the Riva, and explore the old town. 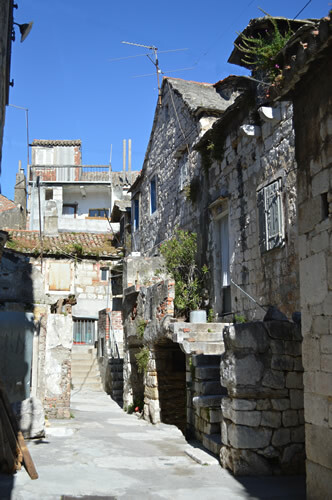 Just for a change, we headed over to the western end of the waterfront, and into the maze of twisty little passages known as Veli Varoš. This is where the fisherfolk and farmers built their houses when they arrived in the city, as opposed to all the grand palaces within the walls of Diocletian’s Palace. 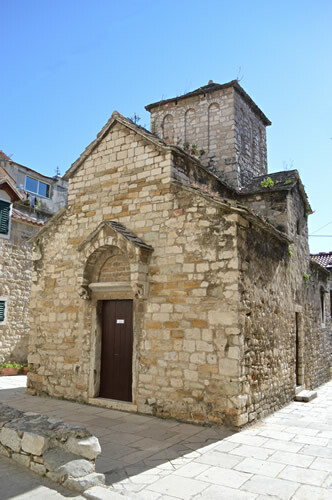 The old church of Sv Mikula (local dialect for St Nicholas) is today set in a perfect little paved courtyard. Back in the 11th century, this was the centre of an old village named Stanja, which derives from Stagnum, the latin for wetlands or marsh. The church has been restored multiple times, most recently to be close to its original pre-romanesque facade, and a later unsuitable belltower was removed. 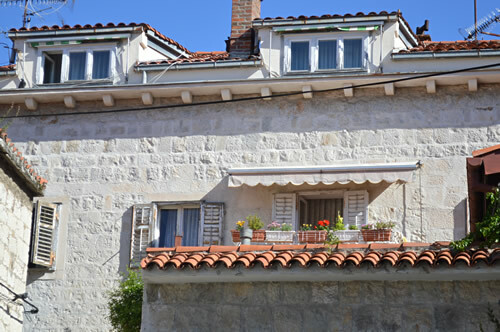 The house next door has been rather beautifully restored, with freshly pointed stonework and traditional dark green shutters. These look to be real wooden grilje, which have slats that open to allow in the light. Very nice! 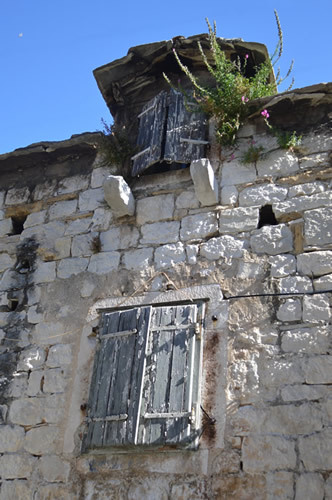 The old houses in Veli Varoš are in the traditional rural style. The ground floor is the konoba, for making and storing your wine, olive oil, and other produce and possibly holding animals, while the family living quarters are one floor up, accessed by an outside stair. The open courtyard may have more outbuildings, and somewhere to filet your fish, and other suchlike messy chores. 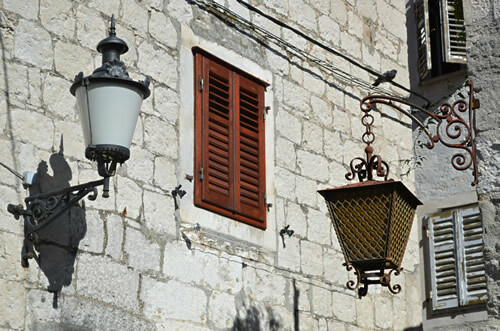 Veli Varoš is one of the earliest expansions of Split outside the defensive walls. 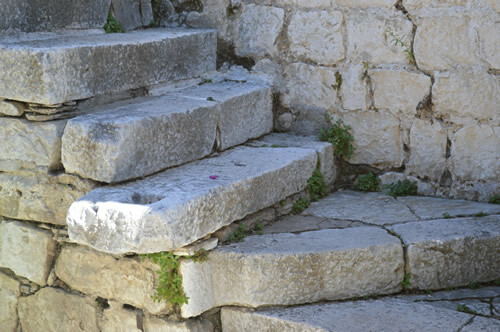 So some of these house will be medieval, and we can clearly see signs of re-used stones for building supplies – as in this stair. The evolution of a city! Although many of the houses in this area are still, shall we say, fading gracefully, there are signs of recent activity here and there. 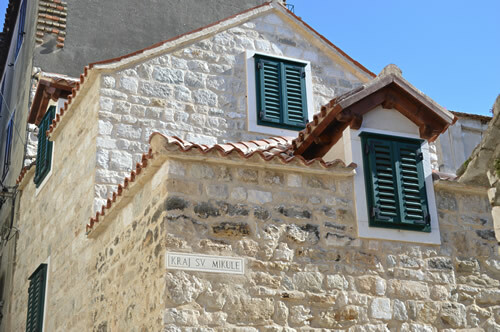 This is becoming a popular area to have an apartment – loads of character properties within easy walking distance to the centre of Split. Sometimes, you can even tuck a small car into your courtyard, though it would have to be a very small one, and one that bends around tight corners on the way in! 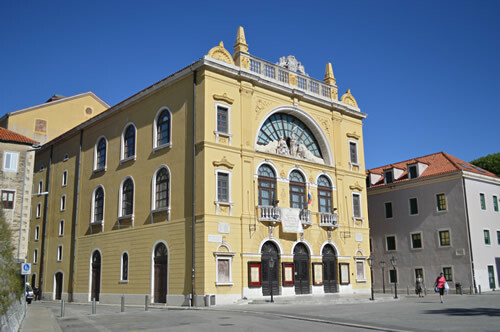 Emerging from the alleyways of Veli Varoš, we turn left and head up the street towards the Croatian National Theatre in Split, a lovely yellow and white confection in the Austro-Hungarian style. It’s also lovely inside, although given that Dalmatians tend to be fairly tall, I find surprising that the seating is somewhat compact, even for me. Always good for a special night out, and they do have a great program from music to plays and opera. On the way back down to the waterfront, we wandered along streets of palaces, built large to impress, with stone carvings and ornate balconies. I see some of the flowers are grown in pots, while others appear to spring out of the stone! 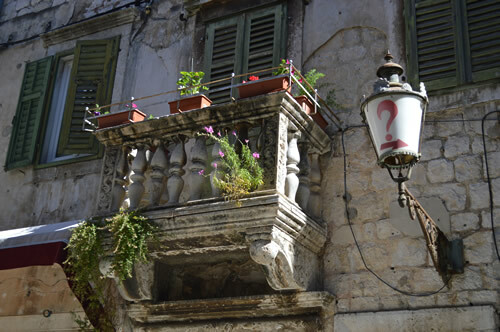 The street lamps are a bit cryptic, though – should I turn right or not? There appears to have been a surge of building here around the 17th century, when things were relatively peaceful. There are descriptions on the wall to help guide you, although the palaces themselves are not open to the public – they’re now apartments and offices. This is a living city, and one of the great joys of staying here is what ancient architectural feature has been incorporated into your thoroughly modern room! 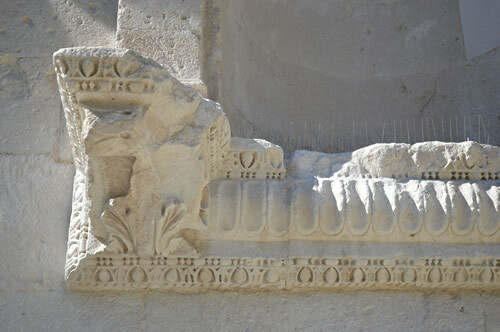 The old palaces have squre blocks of dressed stone, and detailed carving around the doors and windows. Sometimes they may be arched. And for convenience they will probably have a clothes line! The streets are fairly narrow, with a shiny marble pavement. Generations of feet have tramped up and down here, making it really smooth by now. This must be very slippery when wet! 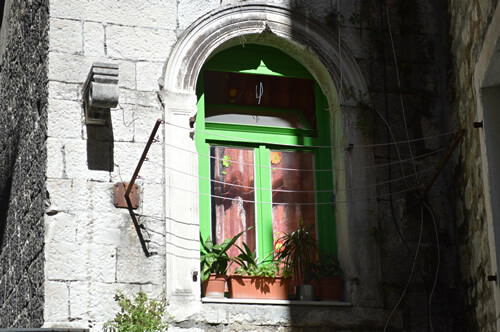 The morning sun is very pretty as it catches the stone walls and the window boxes. 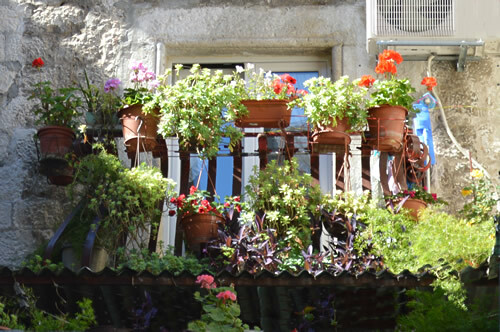 Some people have an entire garden on their balcony! Makes a lovely splash of colour against the warm stone. 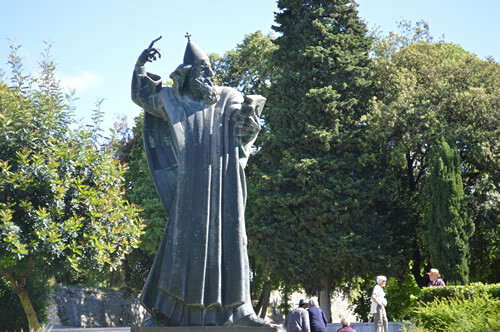 On the way to the Golden Gate, we pass by that marvellous statue of Archbishop Grgur Ninski (or Gregory of Nin) as portrayed by sculptor Ivan Meštrović, breathing fire and brimstone! It’s a truly magnificent piece of art, and we all rub his bronze toe for good luck. The Golden Gate is an ornate affair, with niches that presumably held statues at one time. You can see from the stone carving that it must have been a magnificent entry to the palace, very impressive to the visitors on this, the north entrance. Continuing on round the street just inside the wall, we’re reminded that it’s coming up for lunch time. 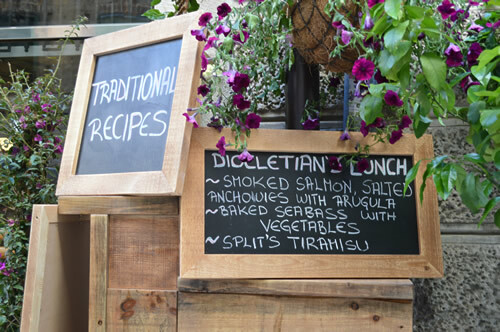 Diocletian’s lunch menu sounds awfully good, but sadly we don’t have time right now. We must remember this for another day, though! We pop out of the backstreets near the cathedral, and suddenly we’re in the bustle of tour groups and market stalls. We’re heading for the main gate out to the waterfront, but can’t resist a quick diversion up to the Vestibul. 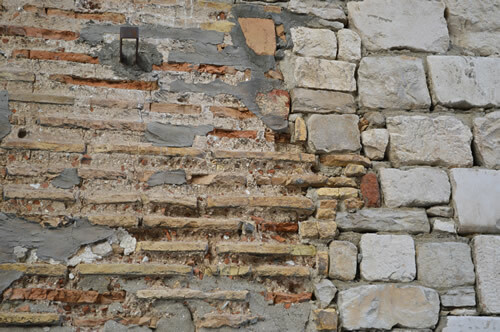 Here you can still clearly see the imprint of the ancient Roman builders, who originally constructed these walls. There are roman bricks still visible next to the dressed stone blocks. Makes a great abstract for a painting! The main entrance for important visitors was on the dockside where in those days boats could pull up right next to the door. 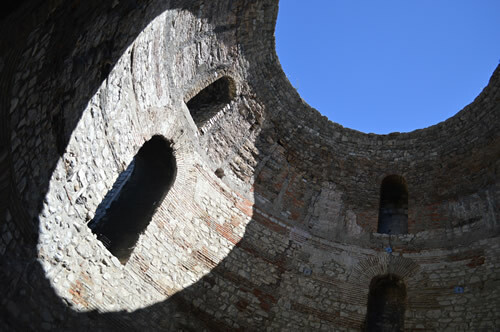 The Peristil was the lobby, where the ex-Emperor Diocletian would meet his guests, and the vestibul above was where he put on his robes. 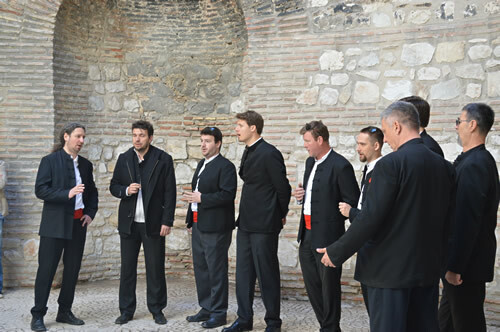 These days, you’ll most likely find it ringing to the harmonious sound of a Dalmatian Klapa group. The accoustics are absolutely perfect in this domed room for acappella singing. Wonderful! Great end to a lovely Sunday morning. We could have listened for longer, but we have a plane to catch!